Ambrogio Lorenzetti (Siena, ca. 1290 – Siena, 1348) was an Italian painter of the Sienese school. He was active between approximately from 1317 to 1348. After the departure of Simone Martini to Avignon in 1336, Ambrogio established a workshop in Siena. His elder brother was the painter Pietro Lorenzetti. They were the first Sienese to adopt the dramatic quality of the Tuscan sculptor Giovanni Pisano and the naturalistic approach of the Florentine painter Giotto. In their experiments with three-dimensional, spatial arrangements, the brothers, particularly Ambrogio, foreshadowed the art of the Renaissance. Ambrogio, more realistic, inventive, and influential than Pietro, is best known for the fresco cycles Good Government and Bad Government (1338-39, Palazzo Publico, Siena), remarkable for their depiction of character and of the Sienese scene. He also painted Presentation in the Temple (1342, Uffizi, Florence) and Annunciation (1344, Pinacoteca, Siena). His work includes also the altarpiece Madonna and Child with Saints (1320, Santa Maria Della Pieve, Arezzo), dramatic frescoes in the lower Church of San Francisco in Assisi, and the Birth of the Virgin (C. 1342, Opera del Duomo, Siena). The peaceful and gently lyrical temperament of Ambrogio Lorenzetti is in complete contrast to bis brother's fiery and often intensely dramatic spirit. Vasari did not realize that the two were related, and wrote of Ambrogio that bis manners "were. .. more those of a gentleman and philosopher than those of an artist," and he speaks about his love of literature and bis intellectual acumen, qualities that enabled him to turn bis hand both to sacred painting and to historical, allegorical and other "profane" themes, to pick up hints from classical antiquity and from the fabled Orient, to be a cosmographer and cartographer, and above all to bring profundity and boldness of ideas to bis work, and to revolutionize accepted notions of iconography. Ambrogio Lorenzetti died from a plague in 1348. Annunciation (1344). In this late and highly finished work Ambrogio abandons his usual earthy depiction of realistic and human detail in favour of emphasizing the almost Gothic elegance of the two characters. They face each other across a floor that is, however, painted in rigorous perspective. The signed and dated painting was executed in 1344 for the City Council of Siena. Ambrogio Lorenzetti frescoed the side walls of the Council Room (Sala dei Nove) of the City Hall, the Palazzo Pubblico, of Siena. The subject of the frescoes are the Good and Bad Government and their effects on the life of the cities and villages. On the wall opposite the Effect of Good Government and to the left of the Good Government Ambrogio painted another fresco called Bad Government and the Effects of Bad Government on the City Life, which uses the same forms and compositional devices as the other frescoes in the room, but inverts them. The malevolent-looking figure representing Bad Government, pointedly labeled as Tyranny, is enthroned and stares hieratically out at the observer.. Neither male nor female, it is fanged, cross-eyed, and porcine, clearly bloated with corruption. In place of the cardinal virtues, personifications of Avarice, Pride, and Vainglory fly over its head. Tyranny is flanked by clearly labeled seated figures representing Cruelty, Treason, and Fraud at the left, and Frenzy, Divisiveness, and War at the right. A bound figure representing Justice lies at its feet. The city to its left is falling into ruin, robbers roam the streets, and, in the foreground, a group of ruffians drags a woman by her hair. Even in its now ruinous condition the image conveys a dire warning. In the hilly countryside the only activities are ones of death and destruction, setting fire to isolated houses and whole villages. The countryside is bare and barren, the trees bear no fruit and no one is cultivating the land. The Allegory of the Bad Goverment is situated on the wall opposite to Allegory of Good Government. At the centre of the dais sits Tyrannia, with the appearence of a demon, with horns and fangs. The figure of Tyranny has flowing woman's hair, a cloak with gold embroidery and precious stones, a gold cup in her hand and a goat, the traditional symbol of lust, at her feet. Below is the vanquised Justitia: the scales are broken and scattered around her on the ground. Around Tyranny's throne are gathered the Vices. This fresco is located on the north wall of the Cappella dei Signori in the Palazzo Pubblico. The Cappella dei Signori was constructed in about 1404-05 on the first floor of the Palazzo Pubblico, next to the important Sala del Mappamondo. As soon as the Cappella dei Signori was finished, the government commissioned Taddeo di Bartolo to paint its walls and vaulting, paying him for the work at regular intervals between 1406 and 1408. The north wall of the chapel is embellished with four large mural paintings depicting events surrounding the death of the Virgin - the arrival of the apostles at her death bed, Christ receiving her soul at the moment of her death, the funeral procession to her burial site and Christ raising the body of the Virgin from her tomb. The Funeral of the Virgin in particular offers a sense of Taddeo di Bartolo's considerable abilities as a painter of narrative: the foreground is occupied by an impressive procession of monumentally conceived figures of different ages, genders and ethnic types. In the background, meanwhile, appears an assured view of a walled city, the buildings of which resemble those of Siena itself, yet making an implicit parallel between the holy city of Jerusalem and Siena. One of the high points of small-scale Sienese painting is the so-called Small Maestà by Ambrogio Lorenzetti. Though small, it is breathtakingly beautiful. First of all there is the dazzling gold setting off the Madonna's outline, with angels emerging from it. Then there is the quality of color. Rarely in early Italian art does one find such as intense red, and in almost no other work has the costly lapis lazuli of the blue been so well preserved. Each part of the scene demands individual attention: the extremely delicate ornamentation and draughtmanship of the draperies, the saints' faces, and the magnificent display of color of the flowers in the golden vase in the foreground. Of all the features of this unique painting, one does not at first notice its spatial organization. The radiance tends to mask the structure of the composition, yet this is perhaps the most remarkable aspect of the work. Here Ambrogio has resolved an artistic challenge that he also set himself in a large Maestà at Massa Marittima. The Small Maestà can be considered as an improved version of the Maestà at Massa Marittima. In the center of the painting the Madonna is enthroned with the Christ Child, six angels flanking the throne at the back. On the left St Elizabeth of Hungary, on the right ST Catherine of Alexandria; kneeling on the left St Nicholas (? ), in the left foreground Pope Clement I; on the right St Martin (? ), in the right foreground Pope Gregory I can be seen. The painting (Madonna del'latte) is related to the earlier Madonna of Vico l'Abate, it demontrates the changes in the art of Ambrogio due to the influence of his elder brother Pietro with whom he worked together in the second half of the 1320s in the Franciscan monastery in Siena. The Gothic Basilica di San Francesco (1326-1475) is a Franciscan church situated in the historical centre of Siena, at the end of via dei Rossi. Like the Basilica di San Domenico, the church has one nave and no apse. The bell tower was built in 1765. The church has a wooden roof and the interior painted with black and white stripes recalls the marble façade of the Cathedral. The fresco shows the martyrdom of the group of Franciscans on their way to China in 1321. Among them are also Franciscan’s monks from Siena. The frescoe depicts the garb of a Mongol commander of a thousand (conical hat with the feather). The Mongol Empire opened intellectual exchange across the Eurasian expanse, generating a century of translocal creativity and cultural innovation. Major artistic centers under the Mongol Ilkhanate, including the workshops of Tabriz, evolved eclectic styles fusing elements from Iranian, Chinese, and Tibetan traditions among others. Sienese merchants and artists developed reciprocal contact with these centers and a growing awareness of Mongol cultural politics. Viewed in their Eurasian context, two frescoes by Sienese artist Ambrogio Lorenzetti, The Effects of Good Government and Martyrdom of the Franciscans, reframe and expand our understanding of the dynamic cultural pluralism that shaped our early modern history. Lorenzetti's Martyrdom of the Franciscans was one of three large narratives completed for the chapter house of the Basilica of San Francesco in Siena that linked the Franciscan Spirituals of Siena with Toulouse in Languedoc. The origins of the Chiesa di Sant’Agostino in Siena date back to the 1200s and throughout the following centuries it has undergone numerous modifications. The most significant of these was carried out by Luigi Vanvitelli following the fire of 1747. The church of Sant' Agostino also contains a chapel frescoed by Francesco di Giorgio and Luca Signorelli. These frescoes were discovered beneath an 18th-century plaster redecoration only in 1977. The Museum of Sacred Art, organised within the museum complex of San Pietro all’Orto in Massa Marittima, houses one of the most well-known Italian paintings from the Middle Ages: the Maestà by Ambrogio Lorenzetti, one of the greatest interpreters of 14th-century Sienese painting. Ambrogio Lorenzetti followed the examples of the Maestà representations by both Duccio and Simone Martini. This masterpiece was created during the mature years of the painter, who united a vibrant feeling of maternal love with customary medieval symbols, particularly in the pose of the Madonna, who is about to seal her deep bond to the Child with a kiss. The Madonna is seated on an original throne composed of the outspread wings of two angels. The throne is set on the last of three steps, upon which are sitting personifications of the three theological virtues. The figures represent: Faith in white, Hope in green and Charity in red. In the field of art, the town does not just enjoy absolute pre-eminence in this part of Grosseto Province, it is also considered to be one of the most important centres of the whole of Tuscany. The town’s works of art mainly belong to the medieval culture and that of Siena. The Chiesa Maggiore dei Santi Pietro e Paolo dating back to the XIII century, is in Romanic style and conserves an altar piece considered to be one of the most significant masterpieces of Ambrogio Lorenzetti. The construction of this religious building dates back to the thirteenth century. There is a nice architrave above the entrance door that inclines to the right. The abandoned Cistercian Abbey of San Galgano with the Montesiepi hermitage rise in the valley of the river Merse, between the medieval villages of Chiusdino and Monticiano. Once, long ago, the community of San Galgano at Montesiepi was the richest and most powerful Cistercian foundation in Tuscany. The greatest builders and sculptors of the Ducento are said to have worked on its great abbey church, and several cardinals left important bequests to the community. However, not very much of this former glory remains: the last group of monks left in 1651, after a series of commendatory abbots had taken anything of value, including the leading that held together the roof of the Gothic abbey church. The Rotunda of Montesiepi was built between 1182 and 1185 over the hut on the hillside where Saint Galgano lived the last year of his life. The small complex consists of the church, which is completely circular except for the small apse, the chapel, with frescoes designed by Lorenzetti and carried out posthumously, and the entrance porch. The small chapel was a later addition to the Rotunda, having been constructed, and clumsily attached to the Rotunda, only in 1340, in accordance with the wishes of Vanni dei Salimbeni. 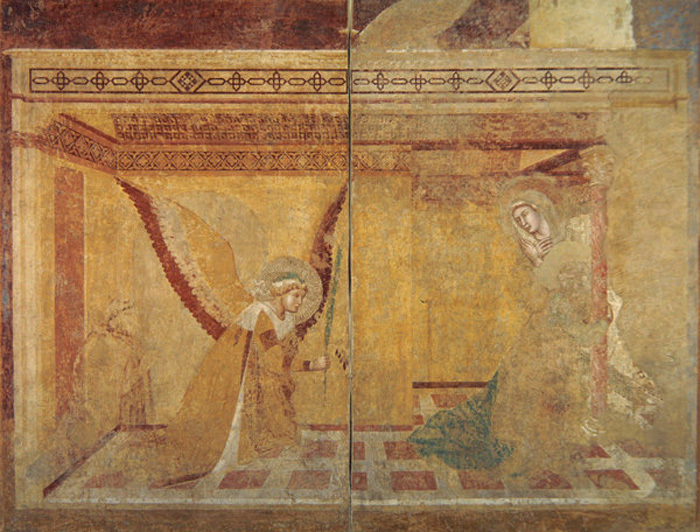 Ambrogio Lorenzetti was commissioned to paint the frescoes, among them the Annunciation with the sinopia of the Virgin (discovered in 1966), who appears almost terrified by the Annunciation; it is considered by many art critics to be an artistic jewel. In 1340 a rectangular construction was added to the original building, set against its northern side. It features cross-vaulting, and is divided into four rooms. This new area was painted with frescoes with a cycle dedicated to the Life of the Virgin, carried out by Ambrogio Lorenzetti and his workshop. On the upper part of the central wall is a Majesty with Angels and Saints, at the foot of the scene is portrayed Eve lying down. In the lower part is the Annunciation. The cupola is especially elegant, being constructed of rows of white stone alternated with rows of red brick, reminiscent of the Etruscan-Roman tombs of Cerveteri or Vetulonia. The whole cycle alludes strongly to the theme of maternity which seems to reappear in the figure of Eve with her prominent belly beneath her lightweight dress. The representation of the Majesty is connected to San Galgano’s vision of the Virgin with twelve apostles; in Ambrogio’s painting Peter, Paul, John the Baptist, and John the Evangelist appear; the other figures which replace the apostles of the vision are a pontiff (maybe Lucius III who canonised Galgano), and four monks, two of which are Cistercians. Ambrogio’s presence at Montesiepi, recorded in 1334, confirms the late dating of the work which was carried out in the last years of the artist’s activity, before he died. He was almost certainly a victim of the plague in 1348, and, in fact, no records of the painter exist after that year. This cylindrical church was built where the knight Galgano Guidotti, become a Cistercian monk, lived as an hermit till 1181, when he died. Is kept here the sword which, according to the tradition, Galgano drove into the rock to symbolise his renunciation to the worldly life. It was consacred in 1185. It has a small semicircular apse and a quadrilateral room used as pronaos; the covering consists in a hemispheric dome with alternated chromatic fascias. In the neighbour chapel, built at the beginning of the 14th century, there are frescoes by Ambrogio Lorenzetti, nowadays damaged, representing Scenes of the life of Saint Galgano, a Majesty and the Annunciation. In a detail from the Maesta fresco, Eve reclines on the lowest step of the Virgin's throne. The reclining figure may be based on Lorenzetti's figure of Pax in the Palazzo Pubblico in Siena. Ambrogio Lorenzetti discarded Giotto's rigorous construction and incisive modeling in favour of open spaces, broadly articulated volumes, fluid composition and a colour range with many gradations. Contrary to Giotto's practice, he introduced subtle psychological effects. Note, in this painting, the intensity with which the mother and child look each other. The Virgin holds the Child with such delicacy that from a realistic point of view the support would be inadequate; the Child appears weightless. A lively detail is seen in the feet, escaping from the swaddling, which are not represented realistically but in terms of the linear cadences of the draperies. Probably intended for private devotion, this panel is an example of highly refined taste and skillful technique. On the gold ground the two large halos are indicated by a fine, incised line; the rectangularity of the panel is modified by the braided arch motif and by the flowers in the upper corners. The two figures are related to each other in a system of undulating rhythms and spiral movements. They widen or narrow with slow waverings in depth. Not a wrinkle mars the compact ivory of the faces and the Virgin's long, seemingly boneless hands. Asciano, a town protected by a 14th century perimeter wall, within which we find the Museum of Sacred Art housing Ambrogio Lorenzetti's painting of St Michael slaying the dragon. The panel was the central part of a polyptych executed for the Benedictine monastery church established by Guido Tarlati, bishop of Arezzo, in 1319. The original location was the Monastero di San Cristoforo a Rofeno. Saint Michael, apart from being the ruler of archangels according to Christian tradition, was also the dragon-slayer and the personal adversary of Satan. Enzo Carli, Sienese Painting, New York, Scala Books, 1983, p. 38. Red earth has been used in painting for millennia. Sinopia was the Italian word for this pigment and it was used for the underdrawing in fresco painting. The drawings themselves are now known as sinopia, much like the word oil can stand for painting. Sinopia color was also used in the fresco itself and in panel paintings, particularly for painting flesh. Sinopia takes its name from Sinop, a cape and port town on Turkey’s Black Sea coast. A bustling trade in the pigment took place in Sinop, though the color was mined to the south in Cappodocia. As paper became more common, fresco design could be done on paper and then transferred by pricking and pouncing to the plaster. Given S. Galgano's ruinous state, it is not surprising these paintings remained almost forgotten until 1904, when Frederick Mason Perkins published the first reproductions and proposed the attribution. Since then, however, they have continued to interest scholars, and there are now several important studies of the cycle: a monograph by Eve Borsook from 1969, articles on the iconography of the cycle by Andrew Ladis and Victor Schmidt, and a study of its patronage by Diana Norman in 1993. Lorenzetti's career is very poorly documented, but the attribution is almost universally accepted; most writers now argue for extensive workshop participation, and there is also general agreement on dating the frescoes approximately between 1334 and 1340.' The later date, about 1340, is usually preferred; because it aUows the paintings to be tied to a bequest in the will of a Sienese magnate, one Vanni Salimbeni, made on June [ of that year. The evidence for Vanni's patronage was outlined by Borsook, and has recently been presented in detail by Norman. Norman, Diana (2007). A Case of Mistaken Identity: Ambrogio Lorenzetti's "Saint Dorothy" from the Church of Santa Petronilla, Siena. Zeitschrift für Kunstgeschichte, 70(3), pp. 297–324. The article, based on extensive research work in the state archives of Siena and on detailed knowledge of local historical sources, proposes a radical re-identification of the subject matter and significance of a group of panel paintings by the fourteenth-century Sienese painter, Ambrogio Lorenzetti. These paintings variously depict the Virgin and Christ Child, a number of saints (including a hitherto unidentified depiction of the early Christian Saint Martha) and a narrative painting of the lamentation over the dead Christ after the Crucifixion. The article offers a reconstruction of how these paintings once fitted together as a multi-panelled altarpiece and traces its long and complex history, which took it to a number of different locations within Siena. The article also puts forward a series of hypotheses as to who the original patron of the altarpiece was, the likely date of the commission, the specific Sienese church for which it was designed and how the paintings’ imagery was peculiarly apt for the proposed original location and religious function of this highly innovative altarpiece. Ambrogio Lorenzetti's City by the Sea is one of the treasures of Sienese art. It's also a questionable picture. What kind of scene is it? Some people see it as a fragment cut from a larger image. 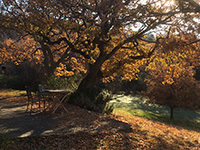 Some see it as an independent landscape. Either way, it is not isolated. City by the Sea has a companion image, Castle on a Lake, of the same size and shape, and with a view that seems approximately continuous. Both paintings are now attributed to Sassetta, as being part of the Arte della Lana Altarpiece. The triptych, the first known work by Sassetta, was commissioned by the "Arte della Lana", i.e. the woolmerchants' guild for the church of the Carmelite Order in Siena in 1423. This article uses material from the Wikipedia article Ambrogio Lorenzetti. Siena reached the height of its splendour in the Middle Ages, when in 1147 it became an independent comune after a century of rule under the bishop. After gaining its independence, the city adopted an expansionistic policy, considerably increasing its domains. But the development and riches brought by trade also accompanied social conflict, which soon developed into a bloody struggle for supremacy between Guelphs and Ghibellines, the two opposing factions that supported respectively the Church and the Empire. Due to its Ghibelline status, Siena went to war against neighbouring Florence, which supported the Pope. Its troops gained a formidable victory against the Florentines at the Battle of Monteperti, on September 4th 1260. Only nine years later, however, Siena was in turn defeated by Florence and the city passed into Guelph hands, heralding a new government and a long period of prosperity. Siena reached its golden age of architecture during the 14th century, when the city was able to erect many of the most important buildings that survive to this day. These include the Campo, the Palazzo Pubblico (then known as Palazzo dei Signori in reference to the city’s ‘Nine’ governors) the Duomo and the Torre del Mangia. This was also the period in which Senese art flourished, with masterpieces such as Duccio’s Maestà. At this time the city invested enormously in costly projects such as the building of the fortified village of Paganico or the port at Talamone. But Siena was also known for its lavish feasts and tournaments, such as the Gioco dell’Elmora, in which young men fought one another with clubs and stones. This game was supplanted in 1291 with the Gioco delle Pugna, in which the contenders fought with their hands covered by a wicker structure, or other games such as the Pallonata or the Bufalata. Piazza del Campo was frequently used for a variety of horse races, which developed over the centuries into the city’s best known event, the Palio. In emulation of ancient Rome, Siena wished to underline its independence. But the great Plague of 1348 decimated the city’s population, bringing decadence and financial collapse. In the fifty years that followed, the city underwent considerable political upheaval, famine and rebellion, which culminated in the end of the government of the ‘Nine’ and loss of independence when in 1390 the city was annexed to the Grand Duchy of Tuscany. Despite losing their independence, the people of Siena retained their proverbial courage and cunning. St Catherine of Siena, who during her lifetime was called Caterina Benincasa, died in 1380 after playing an instrumental role in bringing back the Papacy to Rome from its exile in Avignon, thereby proving that the city had not altogether lost its political influence. Just as it reached its greatest political, financial, social and artistic splendour during the 14th century, during the following century the city of Siena appeared destined to live out its final twilight. With the end of the government of the Nine, Siena entered a period of political instability. In 1403, the ruling Monte dei Dodici was accused of trying to seize definitive power and deposed. There followed a time during which the city was ruled by the Monti Popolari, known as the “Tripartito”, which remained in power until 1480. During the Renaissance, Siena was a relatively small town of about 15,000 inhabitants. The Senese community as a whole was heavily involved in the duties of public office and each individual had a strong sense of personal duty towards the public administration. This explains why many of the city’s great art treasures were commissioned by the city and not by noble families, whose members were far too busy carrying out their functions as Podestà. The Opera del Duomo at the time grew into a kind of artistic and architectural commission that administered the Palazzo della Mercanzia and the Cappella di Piazza. Although in many ways a good thing, the great sense of civic duty that characterised the Senese meant that a good deal of animosity would spring up between any number of people and factions on any number of issues concerning the public administration. A remarkable man named Pandolfo Petrucci was thus able to take advantage of such a chaotic situation, gradually developing his influence to such an extent that he became the ruler of Siena in all but name. An able political manipulator, Petrucci effectively governed the city for about twenty years, from 1400, without actually doing away with its traditional government bodies. Under Petrucci’s rule the architecture of Siena developed considerably. Petrucci erected his own opulent palazzo, naming it Palazzo del Magnifico, but his untimely death when still a young man plunged the city into a new period of political upheaval. Weakened by internal strife, Siena became an easy prey in the territorial designs of the great European powers such as France and Spain. In 1553 Florence allied itself with the Holy Roman Empire and invaded. Siena, which at the time numbered less than 10,000 inhabitants, fell the following year, passing under the direct rule of Cosimo De’ Medici in 1557, who celebrated by ceremonially entering the city and watching a play in the Palazzo Palazzo Pubblico. From this moment onwards, Siena followed the fortunes of the Grand Duchy of Tuscany and its ruling Medici family. On a constitutional level, Siena was not annexed to the Florentine state, retaining its Republican Statute (1544-45) as a newly formed state until the second half of the 16th century with the reforms introduced by Peter Leopold.